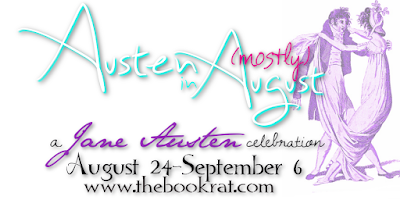 Every year for the majority of Austen in August, I've hosted silly round-table discussions in which groups of Austen authors (or even fellow bloggers & AIA readers) let me interview them, pick their words apart and piece them back together in some of the silliest, most fun posts in all of AIA. I love them. But I wanted to get more of you involved in the discussion, so this year I'm doing things a little different (and even more different than I intended to, since I forgot to post the questionnaire. . .). This year, we're going to have our silly little conversations right here in the comments, and I'm going to pick apart YOUR words and piece them back together in a future post in which we will DEFINITIVELY (mostly) answer some burning Austen questions. So, in the comments, if you please, I'd like you to make the case for which character YOU think is Austen's BEST WORST CHARACTER. You can interpret this how you will. Is it a character you love to hate, like Caroline Bingley or Mrs. Elton? A character guilty of dastardly deeds, like Willoughby or Wickham? All I need is a quick sound bite from you (though of course, you are free to argue for your pick(s) at length), and then in a week or so, I will remix everyone's answers into a "discussion" in which we will try to determine once and for all just which character really is the best of the worst. I love Henry Crawford and I hate Edmund Bertram. This might be controversial but I think Edmund is a wishy-washy a... I think Henry acted like most men that have been spurned by a women who continually turns him down. That just might be my 20th century views. I can relate to saying what the heck and going for it with someone who might care for you. I know many a friend who has found themselves in similar situations. Mrs. Norris is a despicable creature and love that Austen wrote such a great 'love to hate' character. This woman is settled, comfortable, and has a place in the community that should drive her toward compassion and understanding, but uh uh, oh no, she is the dark cloud who makes the people around her miserable. She is parsimonious, cruel, and snobbish. Her guidance is so wrong and affects so many for the worse. In the end, Mansfield Park is lighter and fresher for her loss. Yes! She's such a harpy! It's a lovely way to say 'people of all classes can be cruel'. She's dependent on the Bertrams so she should be humble, and yet, she's intolerable. Good summation of her, Beth! Oh man, there are SO many good ones to choose from! From busybodies and meddling relations to selfish prigs....but in light of this year's AiA pick, I'm going to go with John and Fanny Dashwood. Selfish, self-centered, snobbish, and devoid of compassion, they are just the worst human beings. They can't even care enough to manipulate (well, Fanny manipulates John, but so easily that it's clear John is looking for any excuse to break his deathbed vow to his father and shaft his sisters and the woman who raised him). They have no consideration. To be able to say, here are people I shared my life and home with, for however many years (do we know when John's mother died and his father remarried?) and I don't care if they starve to death, to be able to just casually break the vow made to the man whose fortune you are spending, and to care more about what everyone around you is worth in terms of money than bother to get to know them....I just want to throttle them both. Ugh, blinding by their own arrogance. In a fair world, they'd be utterly bereft of friendship and love.